Check our our announcement for the upcoming ArkMoon Commemorative Coin! Vote for ‘arkmoon’ with your Ark wallet, and visit http://www.arkmoon.com to see how much you are earning. Your address should appear in the table on the homepage with estimates of how much you are earning per day and how long it will take approximately for you to receive a payout. Rewards are now being calculated at the block-level, meaning as soon as you hit the minimum, you get paid. For large wallets, I’ve automatically calculated how much you would earn per day and set the minimum dynamically to do so, to ensure you’re not losing money in constant transaction fees. The absolute minimum payout is 1 Ark. You can see approximately how much you will earn using the calculator at the top of the ArkMoon.com website. I’m a 33 year old senior web developer working out of Virginia, USA. I have over 15 years of web dev experience, and I’m hoping this project will help me get started on more exciting Ark related projects. Please let me know if you encounter any bugs on the website, or if the calculations don’t appear to be correct. If you need to contact me quickly, I’m usually in the Ark Ecosystem Slack channel! You’ll get a response sooner if you find me there. What part of Virginia? I’m right outside Norfolk. Hi i have voted for you but the delegate information says that you are not forging? is everything fine. @victorsundaram - Hey! Just an update, we are currently forging! I’ve fixed the bugs you indicated. Thank you for the heads up! Payments are being calculated and sent out to those who meet the minimum! Also, an update that we’re calculating balances and rewards now every day at 7am (EST) to prevent the constant transaction fees that were being used up every 15 minutes. Thank you again to all of my voters. Please use the payment calculator at the top of the site if you still want to vote for ArkMoon and see what your estimated daily payout will be! We’ve installed a failsafe script that automatically fixes the database if our node encounters any forking issues, which has minimized any downtime. Special shoutout to @faustbrian for his failover script. Make sure to show him some love, because his script has saved delegates a lot of sleepless nights! We are producing just over 422 Ark per day, and automated payouts have been working flawlessly. @arkmoon Hi, I voted for you on October 28th with 102 coins. However, till now have not received any rewards. The calculator shows that I should have received at least two by now. Could you please address this? May be some distribution is not working properly. Thanks! Just an update on my Delegate. I have implemented Block-Level rewards, meaning there will be no more pool hopping. Voters will now only earn rewards if their balance stays above 1 Ark. Pool hoppers who empty their account and move it somewhere else will have their rewards reset and lost! For my loyal voters, this means pool hoppers will no longer be able to swoop in right before a payout and “steal” part of your rewards. 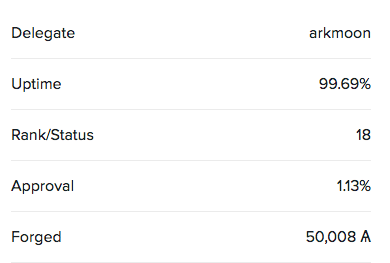 We’ve just surpassed 10,000 Ark rewards paid out since we’ve started forging. Thank you voters! To my voters, if you would like me to increase your minimum payout to reduce the number of transaction fees, please feel free to PM me in the ARK Slack with your address and I can update it manually. We’ve just passed 1,400,000 votes for ArkMoon! Thank you to all my voters for your continued support! All CPU and RAM have been double to increase the node’s performance. Shoutout to @faustbrian , we are running his full suite of node monitoring software, including his failover script, as well as hosting an extra snapshot server to help other delegates in case they need to rebuild their node. Thank you again, my voters, for your continued support! We’ve seen Ark hit an all time high over $6 and I can’t wait to see what the future holds for us! @arkmoon Those look nice! Will definitely be buying at least one. Looks like your connection to ArkMoon Delegate Proposal : 95% share : Live stats calculated every 8 minutes was lost, please wait while we try to reconnect.